"Our research will help inspire tourists traveling to the Caribbean and Latin America to be part of the solution by helping them to purchase wisely." BEAVERTON, Ore. - May 3, 2017 - PRLog -- One tourist at a time can help save the critically endangered hawksbill sea turtle from extinction. A report on a recently concluded three-month survey of nine countries in Latin America and the Caribbean identified more than 10,000 turtleshell items for sale at more than 200 souvenir shops and vendors, representing more than 30 percent of places visited. Though the international trade of hawksbill turtleshell has declined over the past few decades, this report shows that strong demand for these products continues in the region, which has a significant impact on efforts to recover the species. The report, titled "Endangered Souvenirs," investigated 50 tourist spots in Costa Rica, El Salvador, Honduras, Panama, Belize, Nicaragua, Cuba, Grenada, and Colombia. The products identified had a total value of more than US $50,000 though the numbers should be considered very conservative as only products in view were counted. Prices ranged from a low of less than US $1 for bracelets and rings in Nicaragua to as high as US $200 for an elaborate comb in Havana, Cuba. Nicaragua had by far the largest numbers for sale with more than 7,000 items counted and roughly 70 percent of shops found selling them, particularly in markets in Masaya and Managua. Other hotspots for turtleshell sales included Cartagena (Colombia), Puntarenas (Costa Rica), San Salvador (El Salvador), and Havana (Cuba). 35 individuals with 12 conservation organizations collected the data from December 2016 to February 2017 as part of the Too Rare To Wear campaign. "Our research will help inspire tourists traveling to the Caribbean and Latin America to be part of the solution by helping them to purchase wisely," said Brad Nahill, President and Co-Founder of SEE Turtlesand director of Too Rare To Wear, who is a co-author on the report.Too Rare To Wear is a non-profit project of The Ocean Foundation partnering with a coalition of conservation organizations (http://www.tooraretowear.org/conservation-organizations), tour operators and tourism partners (http://www.tooraretowear.org/tourism-partners/), media outlets (http://www.tooraretowear.org/news-media/), and others that support sea turtle conservation and promote ecotourism around the world. Dr. Wallace J. Nichols, past president of the International Sea Turtle Society, helps put it into perspective, "Travel inspires people to learn, form lifelong memories and care about nature. By purchasing local handmade souvenirs that aren't made from turtleshell or from other animals, people can support the positive changes this campaign promotes and be part of building the well-being of coastal communities and oceans." The study shows that North Americans are in some places the top purchasers of these products, along with Europeans travelers. Both North Americans and Europeans pay the highest prices for these products. Cruise ship passengers in particular were identified by vendors as primary consumers in several places, including Nicaragua, Costa Rica, Grenada, and Honduras. Though the international trade is illegal under CITES (the Convention on International Trade of Endangered Species), several vendors reported that their products were imported from other countries, primarily from Nicaragua but Cuba was also mentioned as a source. "Cruise ship passengers in particular need to be discerning when purchasing souvenirs. Several sellers of turtleshell reported that their top purchasers come from international cruise ships and these companies have an opportunity to help stop this trade by educating their clients on how to avoid turtleshell products," said Nahill. This information will assist an educational campaign that Too Rare To Wear (http://www.tooraretowear.org/) launched recently within the travel industry. 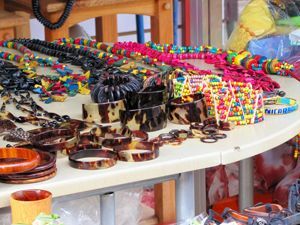 The goal is to inspire tourists visiting these regions to avoid purchasing hawksbill shell trinkets, jewelry, and souvenirs, ending the demand for these products. Hawksbill products are illegal to sell in most places and having them shipped or bringing them back into the U.S. can pose a problem for the buyer as it violates international treaties. As of early 2017, the world's tropical beaches host an estimated 15,000 remaining nesting female hawksbill sea turtles. Market forces targeting hawksbills are outrunning conservation efforts to save the species and its coral reef habitat. This species is found in tropical and sub-tropical waters of the Indian, Pacific, and Atlantic Oceans. Considered to be the most beautiful of sea turtles owing to their colorful shell, which helps to camouflage them in coral reefs, this beauty has also led to their severe decline. It's estimated that in the last 100 years global hawksbill populations have declined by a staggering 90 percent. Their shell is covered in colorful gold, brown, orange, and reddish streaked overlapping scales (also called scutes) which can be polished and carved to make jewelry, trinkets, and other embellishments. Riding on the backs of endangered hawksbill sea turtles and other ocean life is the viability of a recreation industry centered on coral reefs worth well over $10 billion annually. Only a small handful of marine animals specialize in eating sponges, making the role of the hawksbill on coral reefs an important one. By consuming a diet that consists largely of certain species of sponges, they play an important role in the reef ecosystem by keeping sponge populations in check, which allows other species to occupy space on the reef and increases biodiversity. Without hawksbill sea turtles, sponges can overgrow and crowd out vital reef-building corals, damaging the very places that many travelers are coming to visit. The full report can be downloaded from www.TooRareToWear.org/Report. For more information on the campaign and to pledge support please visit: http://www.tooraretowear.org/. A new video on YouTube also tells the story: https://www.youtube.com/watch?v=EDFS63Wc3pQ.